One of the things we get asked a lot as a venue finding agency, is how early is too early to plan a Christmas party? The answer is, it’s never too early! Planning a Christmas party is one of the most stressful events you can be in charge of and so the earlier you can start ticking things off your list the better. 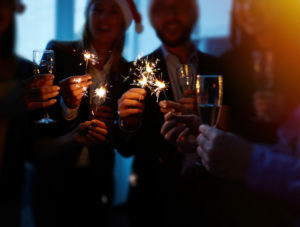 So, to help you out, we hae decided to pull together our top tips for what to think about when planning a corporate Christmas party – including venue finding. It is now socially acceptable to celebrate Christmas from the last weekend in November up until New Year’s Eve, which gives you quite a few weeks (and weekends) to pick from. For corporate events, the most popular days have tended to be Thursdays and Fridays, but they are now becoming popular during the week as well – and some companies are even taking people away for the weekend. I mean what could be better – a family friendly Christmas party with a creche on a Friday with a winter wonderland theme and Christmas dinner, followed by a night in a hotel, cooked breakfast and a half day in the spa? Christmas party and thank you for the great work you have done, all rolled into one. In all seriousness though, venues tend to get booked up quickly, so the sooner you can pick the venue and select the date the better. Picking a venue can take quite a while, meaning by the time you do find one, the date you want could be gone, so why not leave it to the experts? The team at Conferences Group are skilled at finding the perfect venue for you – leaving you free to concentrate on all of the other tasks. Talking about finding a venue, this is the second most important thing to do after setting the date! Not only are you competing with other companies who want to hold their Christmas do at the same time as you, but also winter weddings and charity dos as well. Use us to help you find your perfect venue and get in there quickly! Choosing your Christmas party theme and decorations is the best bit! You could go traditional with a winter wonderland theme, go back in time to the roaring 20s with a Great Gatsby theme, celebrate the weird and wonderful with a ‘Greatest Showman’ theme, or gamble your fun money away with a Viva Las Vegas theme. Whatever you choose, make sure you get your guests super excited to come, by making sure your theme is clear on everything to do with the event – such as the invitations. Many companies are now moving away from an evening event and having an afternoon or all-day events instead. Decide what you want to achieve with your event and then use this to help you to plan your activities. You could, for example, tie in your Christmas event with a team building event – so you will need to get the HR team involved. Take some time to organise things correctly, and really create a bespoke day for all employees. The one thing that most guests remember long after the event is over, is the food and drink they were served. Again, take into account the demographics of your guests and decide what they would prefer. Should you have a formal sit-down dinner or a more relaxed buffet affair or maybe a mixture of the two? One idea we have seen which is gaining in popularity at the moment is to have a Christmas quiz between courses to help break the ice between members of staff. If you are looking to provide accommodation for the guests attending your Christmas party, then you need to let us know when you are at the venue finding stage. Not all venues will offer accommodation on site, but you should be able to find something suitable nearby. Travel options are also important to keep in mind, as if your guests have to go a long way to attend your party, they will want to know whether there is parking available, a local taxi service or even trains nearby. If you are looking for a free venue finding agency to help you with finding the perfect venue for your corporate Christmas party or any other event, then please get in touch with the experienced team at Conferences Group today.